Mark Van den Borre: Flemish educators infected by Ubuntu virus! Flemish educators infected by Ubuntu virus! Enthousiasm is viral. 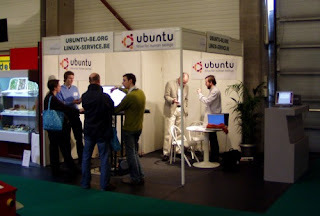 Few visitors or exhibitors at the VLOD education fair last week in Gent, Belgium were able to avoid the ubuntu-be.org volunteers, our booth and our Ubuntu enthousiasm. Four days, thousands of visitors, hundreds of conversations and Ubuntu install sets later. Ubuntu has a meaning and a face now to many teachers, school IT coordinators and their bosses. We know a lot more now about Ubuntu use at schools in Flanders. Some serious use, some skinny dipping. Definitely enough for a few spectacular success stories... in a few weeks, or by someone else. Great Work! In name of humanity, Thank You! Great to hear this. I hope the Ubuntu virus spreads more. I have already caught it.